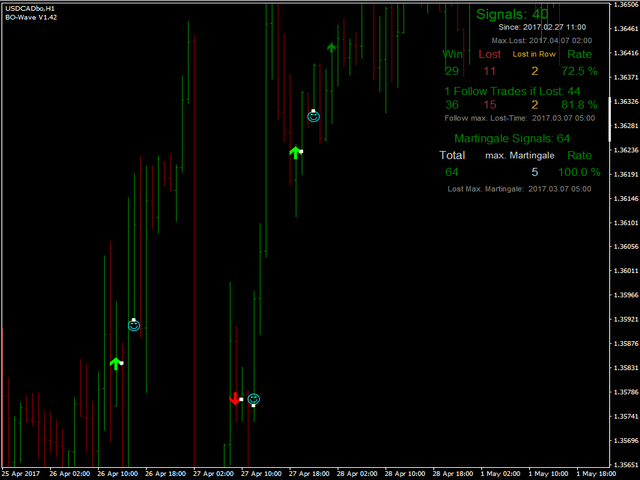 This is a professional Non-repainting indicator for binary option trading. 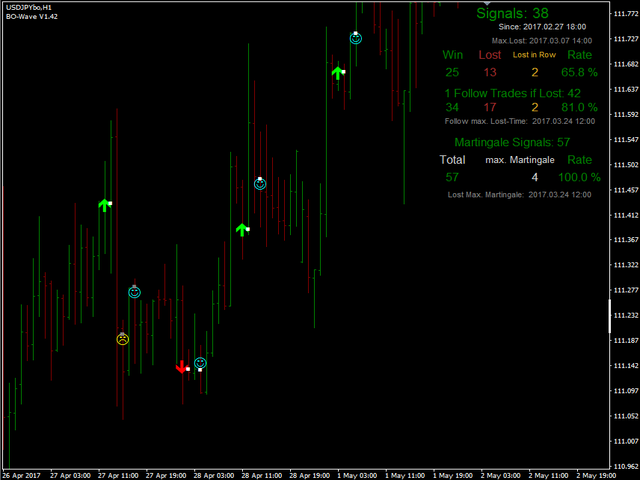 This indicator is optimal for manual trading. 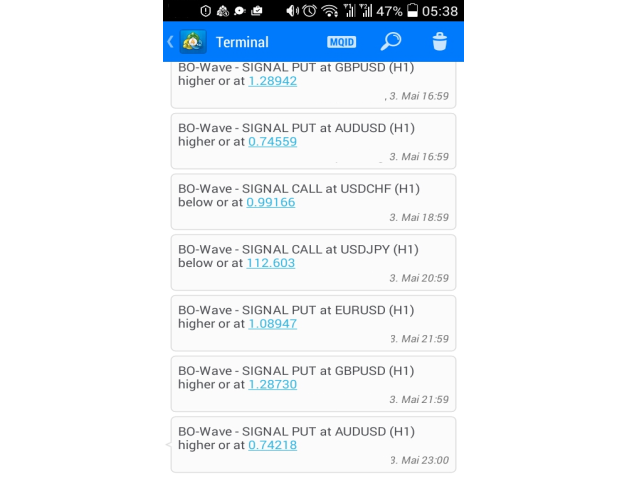 You can send the signals to your mobile phone and open the trades at your broker. 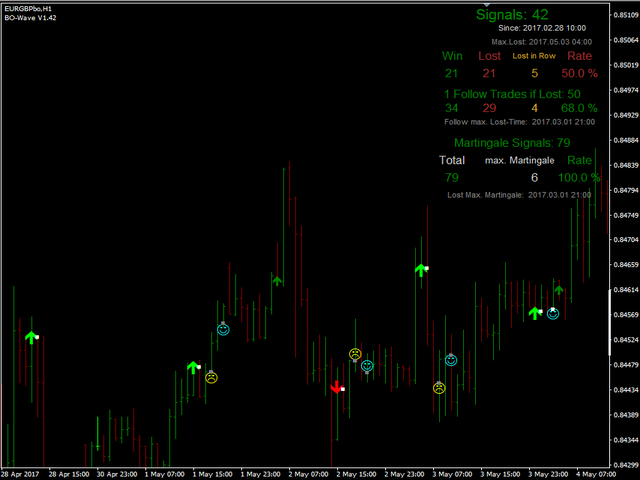 We recommend running the indicator in the Timeframe H1 and place trades with a expiry of 1 - 4 hour. So you do not sit always in front of your PC and wait for a signal. Even if you can not put the trade immediately, that's no problem. 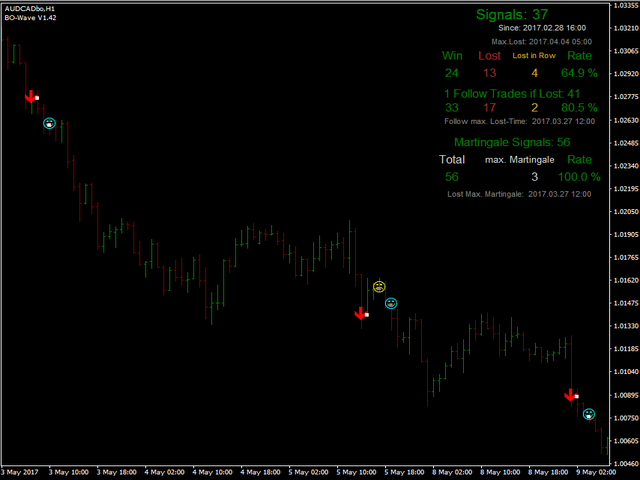 Due to the long-term duration of the trades, you can place it up to 15 minutes after you receive the signal. Please take a look at the chart. 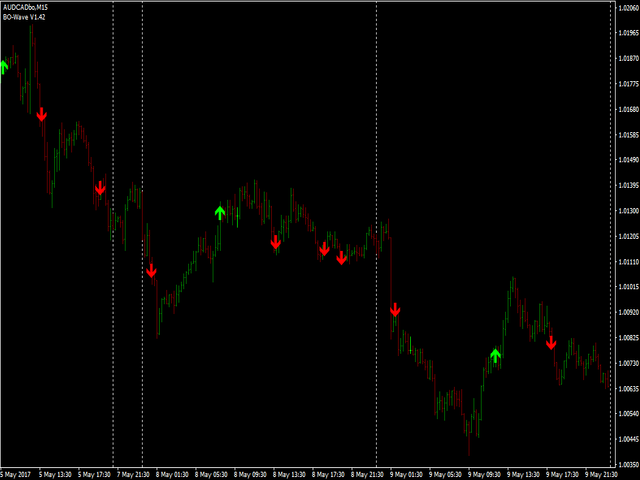 You can use the indicator also on other timeframes with other expiration. Also use Expert Advisor, like our My Binary Option EA for automatic trading. Trend Periods: 4 Trend Periods (fast - slow). Scanner Trend / Flat: Scanner for trend or flat situation. Trend Method: Simple, Exponential, Smoothed, Linear-weighted method. Trend Price: Price (Close, Open, Median etc.). 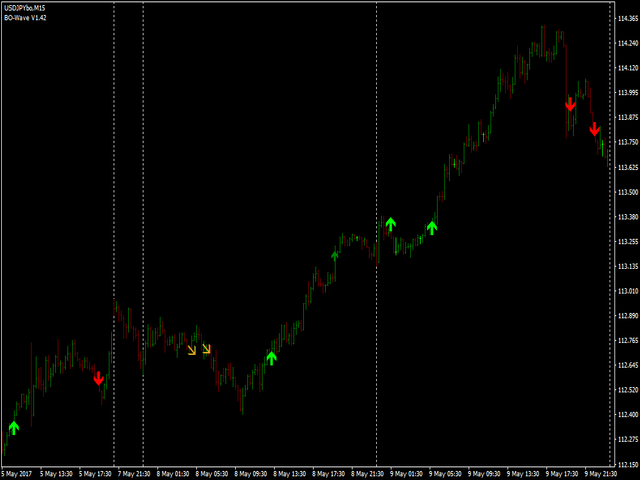 Fast, Slow, Line Period: EMA fast and low period + signal line period. EMA Price: Price (Close, Open, Median etc.). RSI Price: Price (Close, Open, Median etc.). at new & next Signal (no flat signals). 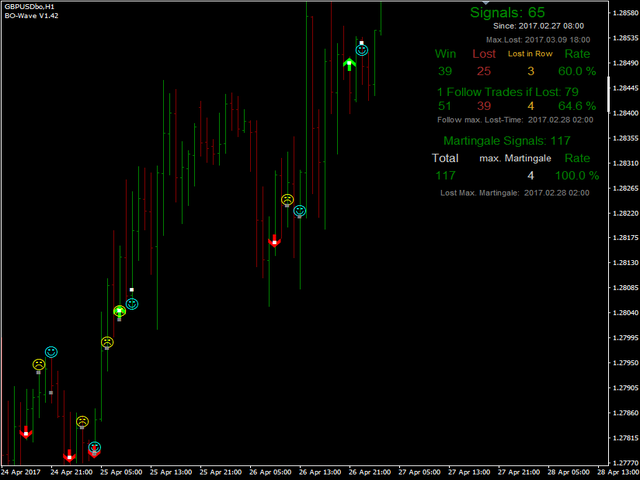 at all Signals (+ flat signals). Mail, Notification, Sound: YES - if there is a signal, an alert and/or a message is displayed. 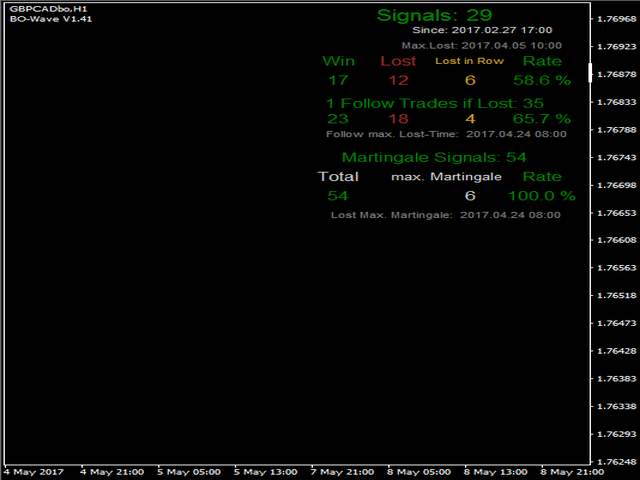 Show WIN/Lost in Chart: YES - signal and Win/Lost results of the past signals are show in the chart, NO - no past signal show in the chart. 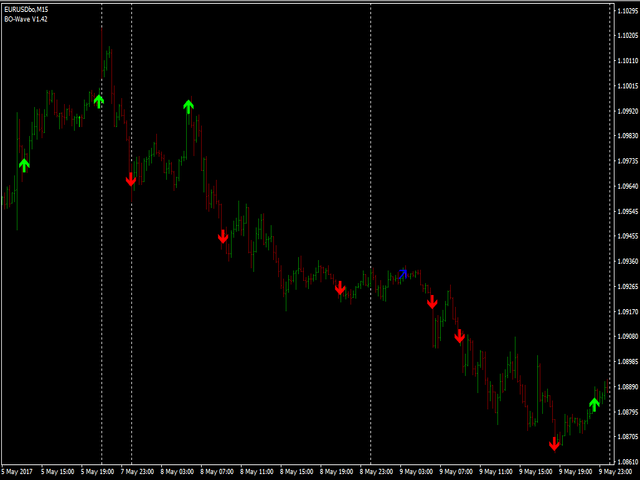 Show Follow Trade WIN/Lost in Chart: Same as before. View Results: YES - show results. In order to be able to view the Forex News you have to read the ForexNews with the script Read Forex News Archive (free).